Nowadays, TV has become an essential part of our daily entertainment life. For those people who are making the jump to a new TV, you’re very likely to choose Samsung TV, which is the biggest-selling TV brand in the world. With Samsung TV, you can not only streaming movies or videos from online sites like Netflix, YouTube, Hulu, but also play local video on Samsung TV from a USB drive. But people often encounter many playback issues since they have no ideal of what file types are supported by Samsung TV. The following will find the answer for you and also offer the solutions to play unsupported file types on Samsung TV. After searching for Samsung TV supported file formats, we get the information from Samsung TV’S official page. You can play following video and audio meet the following standards on Samsung TV. *.wma WMA WMA Supports WMA 10 Pro up to 5.1 channels. WMA lossless audio is not supported. Supports up to the M2 profile. *.mid *.midi midi midi Supports type 0 and type 1. From above tablets, we can see that only video and audio formats meet the specific standards listed above can be viewed on Samsung TV. However, the personal video that you shot with your devices recorders or downloaded from online sites is very likely don’t meet the standards listed above, not to mention to transfer and copy the commercial Blu-ray/DVD disc to Samsung TV. The good news is that here comes the powerful Samsung TV video converter – Pavtube Video Converter Ultimate (get Mac version), which has full support for all media types including Blu-ray, DVD disc and also digital videos in virtually any file formats even including those video and audio file types that are not supported by Samsung TV. 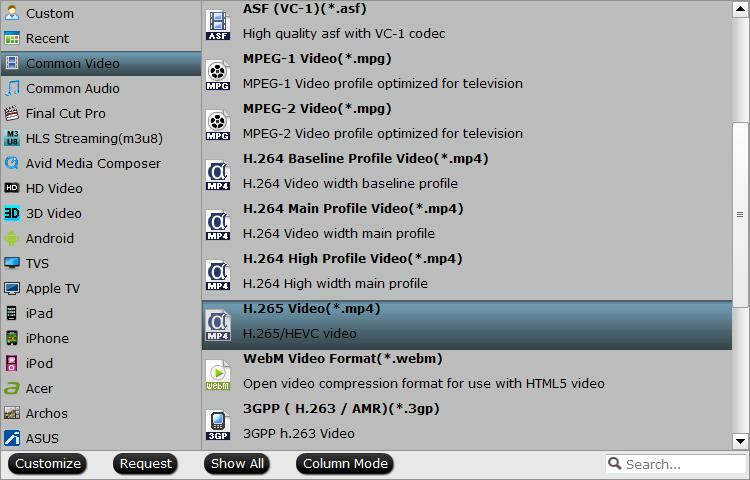 With the program, you can easily output Samsung TV supported video formats listed above and then adjust to produce Samsung TV best compatible playback settings such as video codec, bit rate, frame rate, resolution and audio codec, bit rate, sample rate, channels, etc for viewing on Samsung TV with best video and audio quality. 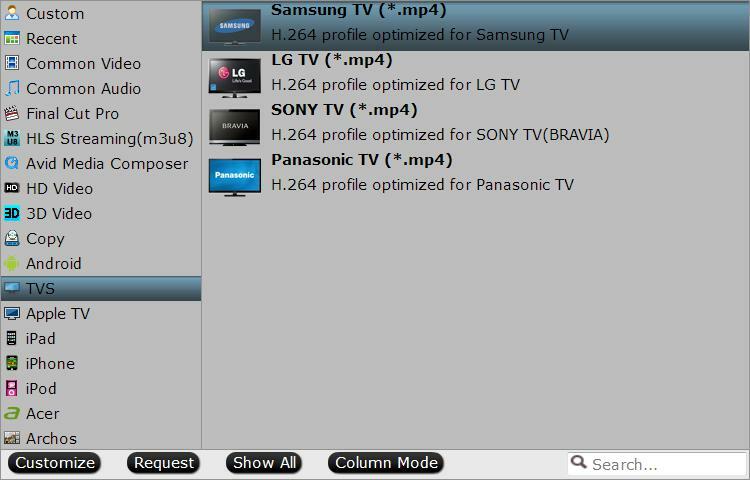 Tips: For those people who have no idea how to tweak those advanced settings by your own, you can also use our program to directly output Samsung TV specially optimized profiles with the optimal playback settings. For Samsung 3D TV owners, you can also use our program to produce Samsung 3D TV playable Side by Side, Top and Bottom and Anaglyph 3D mode video with the format of AVI/WMV/MP4/MKV/MOV. Step 1: Load unsupported file formats. Start the application on your computer. For loading digital video, click “File” > “Add Video/Audio” or “Add from folder” (batch load multiple files) option. For loading Blu-ray or DVD disc, Insert your Blu-ray or DVD disc into your computer’s optical drive , hit “File” > “Load from disc” option. Clicking the Format bar, from its drop-down list, select one of Samsung 4K TV playable file formats such as “H.265 Video(*.mp4)” under “Common Video” main category, then click “Settings” to change other profile settings to produce Samsung TV best playback settings. If you have no ideal how to complete those settings on your own, feel free to directly produce Samsung TV preset profile formats “Samsung TV(*.mp4)” under “TVs” main category. After all setting is completed, hit the “Convert” button at the right bottom of the main interface to begin to convert unsupported video or disc media to Samsung TV compatible file formats or preset profile formats. Step 1: Plug a USB storage device into a USB port at the back of your Samsung TV or the Mini One Connect of your TV. How to Solve can’t Play MP4 files on Panasonic Viera TV ? How to Play MP4 Files on Samsung TV from USB Port? How to Play and Watch Sony RX10 II/III 4K Video on Samsung 4K TV?